Dymelife Magazine spotlights established and up-and-coming glamour models from all over the map. Issue #26 brings Twixx Kisses for her 3rd cover! Featuring Angelle, Crystal Anonymous, Eri Nicole, Hai Noon, Lynn B, Taneka Glam & Vonshea Love!! Issue #19 3 COVERS: Tychi, Lynda Rose or Elba Everlasting! Our features, Summer Monroe, Nina Blaze, Gemini Bell, Tashanda TK & Miss Curvey! Double cover featuring Vella the Vixxen & Vixen Vanity with Anae, Maja, Vinaa, Jazzy, Vanity, Spotlight & Babydoll! Just the way you like them! Double cover featuring Vixen Vanity & Vella the Vixxen with Anae, Maja, Vinaa, Jazzy, Vanity, Spotlight & Babydoll! Just the way you like them! Happy New Year! This issue's cover 1/3 Serenity Snow, featuring Crystal Anonymous, Kspen, Myah, Dolly the Dream, Assata, Mary Jain & Tiana Shanel! Happy New Year! This issue's cover 3/3 Crystal Anonymous, featuring Serenity Snow, Kspen, Myah, Dolly the Dream, Assata, Mary Jain & Tiana Shanel! 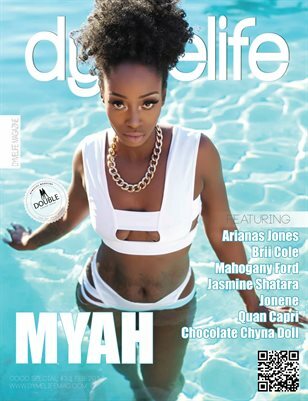 Dymelife #10 Double cover, Shani Rose, featuring Netta Superbad, Michel Bombshell, Nilee Jada, Twixx Kisses, Ms. Milan, Dakari & Nique Monae! Dymelife #10 Double cover, Twixx Kisses, featuring Netta Superbad, Michel Bombshell, Nilee Jada, Shani Rose, Ms. Milan, Dakari & Nique Monae! Dymelife's Butter Pecan edition. Double cover, Vanessa XoXo. Featuring Tina, Keshani, Lady Natalie, Angie Cruz, Equella, Meghan Marie and Mz. Vib! Dymelife's Butter Pecan edition. Double cover, Lady Natalie. Featuring Tina, Keshani, Vanessa XoXo, Angie Cruz, Equella, Meghan Marie & Mz. Vib! Double cover issue #09! Stormii Maya featuring Summer Monroe, Tx Kittie, Toy Jordan, Mz Cami G, Sky, Heather "Dutchess" Steeves & Shy! Double cover issue #09! Summer Monroe featuring Stormii Maya, Tx Kittie, Toy Jordan, Mz Cami G, Sky, Heather "Dutchess" Steeves & Shy! Dymelife #05 featuring cover model Strawberry Sisi, K. Monay, Lady V, Jasmine Shatara, Shine ‘LikeNoOtha’, Izzy Monet, Desiree Wilson, Annie Rocq! Dymelife Magazine #02 Featuring Cover Model Namea Soundz, Tigeress, Sweetface, Caliegh, Chynadoll, Redlight, Chelsea Renee and Kiera. Debut Issue featuring Cover Model Yemaya, Finesse, Dulce, Jarohnya, Ana, Izzy, Kami Renee and Daijah Nicole.